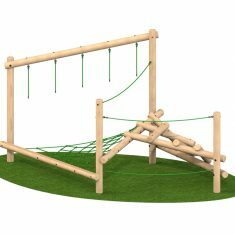 The Log Maze Climber is a combination of machine rounded poles that are secured in a seemingly random manner with interlinking nets and ropes making a unique type of climbing unit. All of the vertical poles are secured safely into the ground and have a heat-sealed bitumen sleeve fitted at ground level thus restricting moisture affecting the timber and delaying rot. 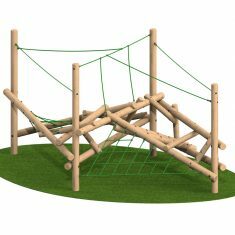 Crisscrossing timbers and ropes on these climbers encourage children to climb through, over and under. 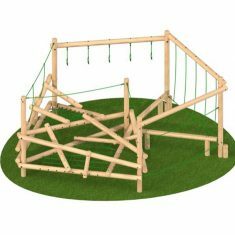 A range of configurations offer different degrees of challenge and the combination of timber logs and angled beams create a challenging and fun piece of play equipment. These units help to build social skills, along with physical, creative and interactive play. In particular, they improve the child’s spatial awareness and develop gross motor skills. 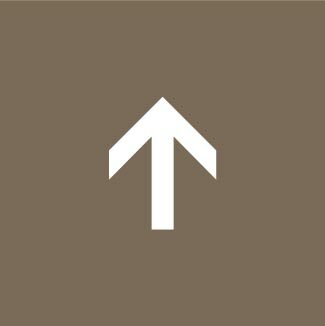 We supply a range of sizes and configurations – the smaller units are more compact so will fit where space is restricted. 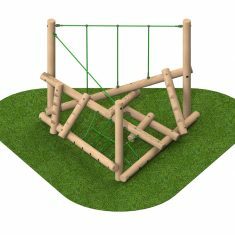 They have a basic construction with net and high level wires for support.The larger models include rock climbing wall units, outlook towers and slides. 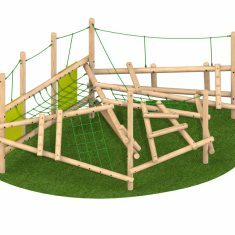 The Log Maze Climbers come in four sizes each being a challenge to older children but also suitable for younger children. With no start and no finish and no set direction these units offer great play value. We can provide a log maze stack to suit your budget and play space.